Is exercise something you consider a necessary evil for staying healthy and fit? Is it more drudgery and duty than an eagerly anticipated activity? If so, you’re not alone – there are a lot of people who would rather go see the dentist than “exercise”. This is why New Year’s resolutions to exercise more don’t last past February more often than not. If it is something you hate to do or are grudgingly obligated to do then you are not likely to stick with it long term. I think one of the things that prevented me from falling in love with exercise was the fact that I associated it with in home stationary bikes and aerobics via DVD or VHS. I personally can’t stand either of those things and yet that is what I grew up with. Dad rode a bike and mom did aerobics. Blah! Both of them were pretty active but that is not what I ended up associating with health and fitness. Riding a bike in the house or sweatin to the oldies is just not for me. It has to be something you love and are committed to. If you fall in love with exercising, you are far more likely to keep it up. But how do you go about falling in love with exercise? I use SparkPeople and Daily Mile to track fitness goals and workouts. Seeing what I have accomplished, earning points, or seeing myself at the top of the leaderboard give me incentive and they make me proud of my accomplishments. Its like a game. Of course you can also literally play a game. Some popular gaming systems have workout “games” that have been known to make dedicated “players” out of those who had trouble sticking to an exercise routine. Users say that the reasons why these games keep them interested are the variety (your workout varies each time, reducing the boredom associated with DVDs and videos) and user control. We have EA Sports Active here and I love the virtual running track. There are dance-based games as well, where you sweat and burn calories while having fun dancing. We really want to add Just Dance 3 to our collection. Oh heck yeah! My gym time 4 days a week is my “me time”. I get a much needed break from my children and I get out of the house. Since I am alone with my kids for much of the day and all of the evening this is soooo important to me. If you can merge your exercise routine with some much-needed time for yourself, you may find yourself looking forward to workouts. Maybe it’s outside in your yard/neighborhood, or in a local park, or the gym – the point is to tailor your workout to fit your personal needs so that it’s your thing, whether it’s time alone or time with others. My weekly water aerobics classes have lead me to make some great friends and develop my lacking social life a bit more. I love walking into the gym and catching up with the ladies. There seems to be a misconception that you have to hate your exercise for it to be effective – sort of like eating your spinach as a kid. If it tastes/feels bad, it must be good for you. But there are so many fun options when it comes to exercising that there’s no excuse to hate what you’re doing! Certainly, exercise is work and doesn’t always feel great right at the moment. But choosing an activity you love will help you keep it up even when it gets tough. Dancing, horseback riding, hiking, jumping rope, hula hooping, belly dancing, Pilates or Yoga classes, martial arts, etc. are all forms of exercise that can be so much fun you forget that they are work (and you’re more willing to push through when it does feel like work). Write down how you feel as you progress. Do you have more energy? Are you running/walking faster? 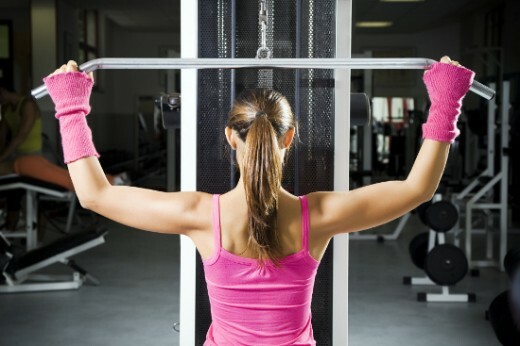 Are your muscles more toned? Have you lost weight? Keep notes on how you were when you started and throughout your progress. Looking at this list can be a boost and help you love your exercise routine because of what it’s doing for you. Not only will you be doing something good for you, your kids will see exercise as something FUN and be more likely to pursue fitness themselves. So, have you fallen in love with exercise? What are your tips?